TaskPaper: a to-do app for the rest of us? I've been dipping my toes into GTD territory for some time. I've tried doing it in Backpack, Basecamp, iGTD, OmniOutliner, and the OmniFocus beta to name a few. I seemed to get on okay for a while with each of them, but eventually I gave up; they were either just too complicated, or web-based which doesn't play well with the uplink tube at my work. I came across TaskPaper from Hog Bay Software. I had played with their WriteRoom app a while back, but it wasn't something I had too much of a need for. At first glance, TaskPaper seemed just too simple. But when I actually started using it, I found that its simplicity was exactly what I needed. It's like a piece of paper with fring benefits. The simple syntax->format mechanism fits my programmer brain, and the fact that I can make up my own structure in a document without the application getting in my way is priceless. That's what always ended up putting me off the fuller featured apps in the end, and it's what ultimately sold me on TaskPaper. 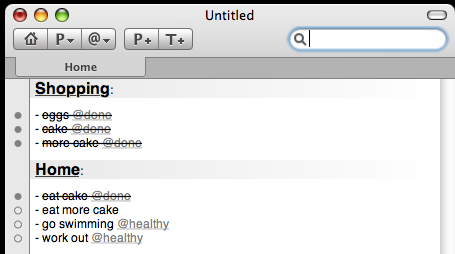 To define a project, you type in the name of the project followed by a colon. That's it. TaskPaper turns what you've just type into a nice title. Within a project you can create to-do items by typing a dash as the first non-whitespace character on a line. It doesn't force that dash to be at the left margin though, so you can create simple subtask structure without any fuss. It doesn't do rollup of those subtasks, but then why does it need to? So you can still see your projects, but only the important, cake-related entries within. So it actually does a fair bit more than you might expect, but just as importantly, it doesn't try to do too much. There's a 15-day trial, and if you like it it's $18.95 so I'd recommend giving it a go.